I love how advanced TV’s are getting. They’re flat, with amazing 4K resolution available. Many will also let you go online for content as well. Bottom line, they look great visually but picture is only half of the presentation. Good sound from that small space is hard to do. Enter the soundbar. Today we will be covering the Creative Sound BlasterX Katana. The Creative Sound BlasterX Katana is a great looking system. It is actually a 2 piece system that encompasses a sound bar and a separate subwoofer. And fun was part of the equation, with its selection of colors to choose from for ambient light. Will be a great feature for gamers. So it’s actually quick versatile, being able to be used as a traditional sound bar, for a gaming system, or for a stand alone music system. The Creative Sound BlasterX Katana came in a nice looking color printed box, with photos and specs of the system. It was well protected in the box, and came with the instructions, remote, power cord, and multiple USB cords as well. Materials used for the construction was metal and plastic on the sound bar. The subwoofer appeared to be a laminate on wood design. Quality of materials used was very good as was the finish. It’s the quality I have come to expect of Creative. Setting up the Creative Sound BlasterX Katana was very easy. There is the one control panel on the back, with all the connections clearly labeled. The only connection type that I would have liked to have seen that was not there is HDMI. Hooking it up to my cable box then an optical cable was simple. And trying out other devices like an mp3 player and smartphone with the other connections and Bluetooth was just as simple. Creative has a long history of experience with audio products. So the performance should have been no surprise for me. But it still sounded better than I expected! Watching a college football game, the vocals were very clear, intelligible and distinct. The cheer of the crowd came through loud and clear through a very large and surprisingly deep soundstage. Watching the mining colony scene in Guardians’ of the Galaxy, the highs were crisp and clean during the glass breaking, plasma shots, and explosions. Mids were warm, detailed, with a lot of resolution. The midbass from the sound bar was also better than expected. The same can be said for the small subwoofer. It had good low end extension and provided output without being distorted or muddy. The same can be said for the sound of them. Listening to music through the analog input. Dynamics were very good, as was the imaging. The soundstage was large and much deeper than expected. Vocals were very smooth with great harmonics and texture. Highs were crisp and clean without being overly bright. Mids were smooth and not overly warm. Bass had good detail and depth with sufficient low end extension. I truly enjoyed the Creative Sound BlasterX Katana has large amount of versatility. As a traditional sound bar, it will add significantly better sound to your TV, without the need of a lot of wiring. I was not able to pair my HTC One M8 with it through Bluetooth, but sometimes there are compatibility issues between devices. Flash drives and using the analog connector is a great way to listen to music through the Creative Sound BlasterX Katana. The ambient LED lights also make it fun for gaming. Creative has a long history of delivering great audio products. This tradition continues to go strong today, which the Creative Sound BlasterX Katana are proof of it. The sound bar will fill even a large room with great sound. Only when turned up nearly full blast does it sound a bit strained. Otherwise, the sound is very good. If you are in the market for a sound bar, the Creative Sound BlasterX Katana should be on your short list. 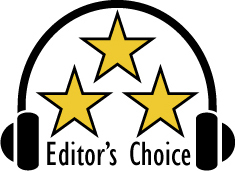 Based on its design, features, quality and performance, the Creative Sound BlasterX Katana has earned our Editor's Choice Award. For more info and complete specs, check out their website at www.us.creative.com.